Hey guys! Another simple meal coming at you. This is a great go to on meal prep day. Pre prep and throw it in the fridge and cook when your ready. Slice bell peppers in half starting from stem and going to the end. Remove all seeds and stems. Place bell peppers in a large pot with water and salt and bring to a boil. Boil for 5 minutes. In the meantime brown the ground turkey and onion in skillet on medium heat. Drain bell peppers and meat mixture. In a large bowl combine meat mixture, garlic, salt, black pepper, creole seasoning, quick oats, and Worcestershire. In a smaller bowl combine 1 egg and half of the tomato sauce and mix. Add the tomato sauce mix to the meat mixture and combine. Set to the side. 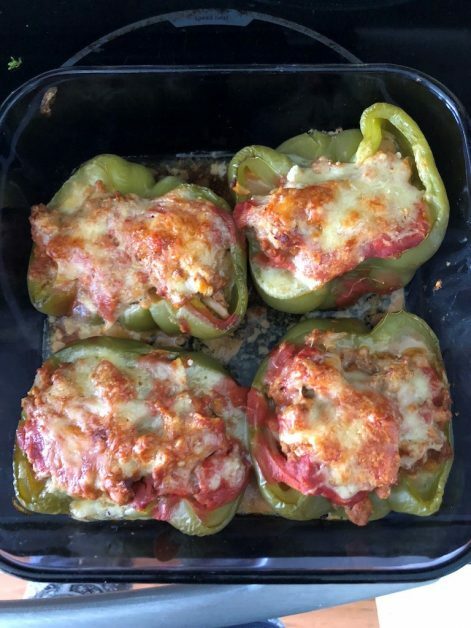 Place your bell peppers in a 9×13 casserole dish face up. Add about ½ cup of mixture inside each bell pepper. Spread the remaining tomato sauce evenly over the bell peppers and top with 1/4 oz of shredded Monterey jack cheese. Place foil over the bell peppers and bake at 375 for 35 minutes. Pull off foil and cook another 5 minutes.